Patients with lymph node metastases of prostate cancer (LNM) appear to respond better to 177Lu-prostate specific membrane antigen (PSMA)-617 radioligand therapy (RLT) than patients with end-stage prostate cancer. The present study aimed to analyze the outcome with 177Lu-PSMA-617 RLT for a group of patients with LNM. 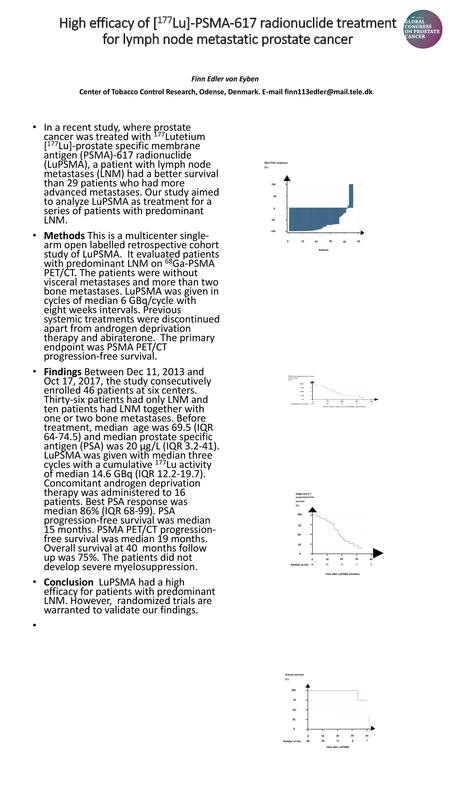 In this multicenter study, we evaluated the antitumor effect and the safety of using 177Lu-PSMA-617 RLT for 36 patients with LNM and 10 patients with LNM together with one or two bone metastases. Cumulative 177Lu activity of 177Lu-PSMA-617 RLT was median 14∙8 GBq (IQR 12∙0-20∙4). The largest lowering of PSA was median 86% (IQR 68-99). The patients did not develop grade 3-4 myelosuppression. 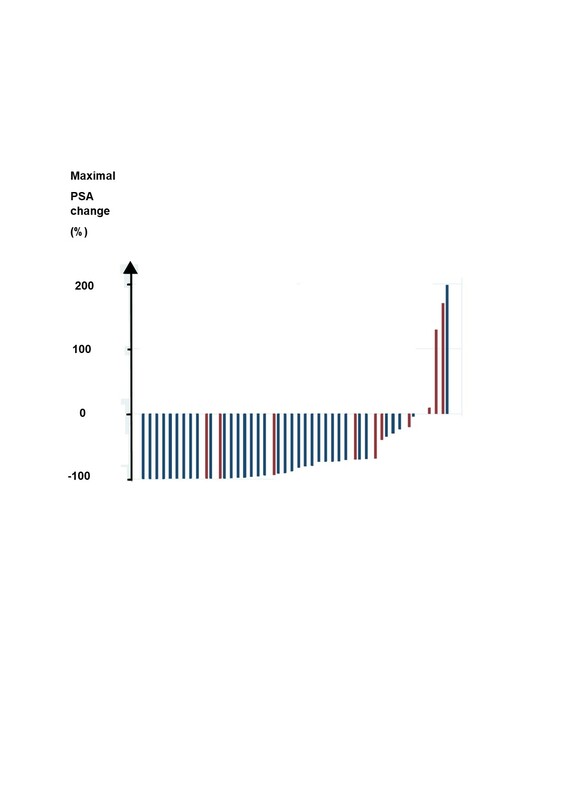 During follow-up, 25 (54%) patients had PSA progression. 23 (50%) patients developed new metastases and one (2%) patient died of prostate cancer during follow-up. Patients with LNM and PSA before treatment <4 µg/L had a lower PSA after treatment with 177Lu-PSMA-617 RLT than patients with PSA before the treatment >4 µg/L (p=0∙001). Patients with Gleason score ≤8 had a better PSA progression-free survival than patients with Gleason score 9 (p=0∙027). Patients with LNM had a better PSA progression-free survival than patients with LNM combined with one and two bone metastases (p=0∙0003). In conclusion, the outcome with 177Lu-PSMA-617 RLT for patients with recurrent LNM was markedly better for patients with Gleason score ≤8 and with LNM than for patients with Gleason score 9 and with LNM combined with one or two bone metastases.